The thraex unlike other gladiators were also called ‘parmulata’, since the rectangular shield they carry were much smaller than a typical gladiator shield and instantly made this class of gladiator easily recognisable. The thraex gladiator originates from the warriors of Thrace which is now commonly known as Bulgaria, and as well as their shield, they are easily recognised by their helmet crest which was a griffin’s head. The griffin was itself a mythical creature thought to be so strong, and had the body of a lion, though of as the king of the beasts, and the head of an eagle, considered to be the king of the birds. The thraeces gladiators would get their inspiration and strength from the representation of these two powerful creatures. The thraex gladiators main weapon was the sica, which was a short sword with a curved blade. This style of sword allowed the thraeces to strike the opponent in the posterior part of the body, with much greater ease, and was a very adept weapon at slicing motions to any parts of a foes body. A thraex stands tall before the fight is about to begin. The lightweight weapon carried by this mighty animal inspired gladiator was incredibly lightweight and allowed the thraex to be one of the most mobile and dexterous gladiators in combat. 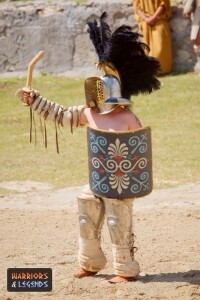 Thraex Gladiators wore a helmet, known as a galea, which was defined by its wide brim. Sitting on this crown of the helmet was a tall crest, known as a lophos, that would be slightly bent forward and adorned with a griffin ornament on top representing the head of a griffin. For visibility the thraex was limited to to small eye openings which may either be one or two small holes. The right arm of the thraeces gladiator would bear his weapon of offence and therefore was is protected by a sleeve, known as a manica which could protect only the front or the arm or could reach up to the shoulder and beyond. Here we see the thraex battling a murmillo as the crowd looks on. At the lower part of his body, the thraex had shin guards for their lower legs and knee high overlapping bands of leather or metal that protected the upper leg, also up towards the groin. The thraex typically fought the Mirmillone and Hoplomacho, as well as other thraex gladiators, and were equally suited to fighting all three. The Thracians warriors after which this gladiator was named were tall and slender. Hence it is assumed that the thraeces had toned and long bodies. They moved fast and relied on their agility as opposed to the heavily armed Murmilo gladiator. As we mentioned earlier this speed was also present in their weapon choice with a nimble sword to reflect their agility. We can see in many paintings that the thraex is represented in different ways, sometimes they remain with the heavy helmet and high greaves, but they change the weapons of offence and defence. While remaining a ‘parmulato’, or gladiator armed with a small shield, the weapon of defence may have been a spear instead, and after this is thrown during the first part of the fight, the thraex would switch to his trusty sica or his small sword to finish off his opponent. A thraex gladiator battles bravely with a hoplomachus in the ampitheatre. 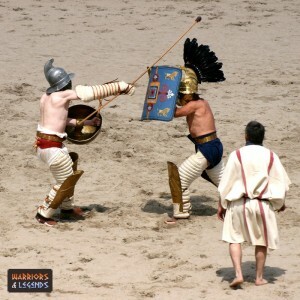 The thraex Gladiators are the oldest type of gladiator, and also often thought to be one of the most common. Of all the gladiator categories, this is one class that did not evolve into a variation of themselves or another gladiator. Thraex Gladiators were a crowd favourite among women, and if armed with a spear they were known for being very accurate at hitting a target. They first appeared in 78 BC. Thracian’s were said to be Emperor Caigula’s favourite so they were allowed to live sometimes even if they lost a fight. 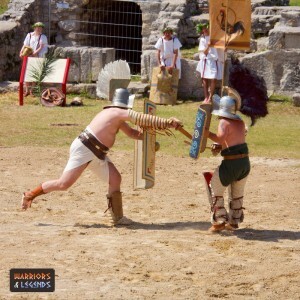 With their tall and wiry build, the thraex gladiators were typically fast and agile. Skilled with their sword the sica, they could slice a hundred cuts into their opponent or end them with one killing slash. Not only popular with crowds but one of the most common gladiators the thraex would be entertaining and fast paced, displaying feats of agility you might not get with other classes.